What a pleasure this album is. This is a good old-fashioned score, reminiscent of Steiner and Korngold, with a gorgeous, heart-warming main theme -- a broad-spanned, memorable melody, the sort that is cherished by all incurable romantics. Furthermore, all 21 tracks on this CD are interesting. One gets to, say track 14 - a meltingly beautiful Debussy-like piano solo Nocturne with moon, and one thinks, surely there cant be anything more as good as this, and all the music that has gone before, but the album continues to enchant. Of how many film music CDs, can one honestly make such a commendation? The score opens with a statement of the 1900s Theme which is soon interlaced with some Gershwin-style jazz to, presumably, connect the Old World with The New? This lasts just 1½ minutes but it is followed by an 8-minute cue, featuring Fausto Anzelmo (viola) and Gianni Oddi (soprano saxophone), The Legend of the Pianist, in which this main theme is declared in full sweeping, passionate mode. The cue also contains seascape music that would not have shamed Debussy or Atterberg, together with more jazz material. Jazz is an important element in this score. There are source music cues like Scott Joplins Peacherine Rag and Jelly Roll Mortons The Crave. But there are also many more original jazz cues written by Morricone and Amedeo Tommasi whose breath-takingly nimble fingers impress in renderings of them all. Another pianist, Gilda Buttà is used for the more classical tracks. She makes her first appearance on The Crisis which must be a crisis of confidence for the student virtuoso pianist because he keeps hitting a wrong note that persists through this cue  and throughout Child an engaging little piece with flute solo and orchestra. But it is in her beguiling and poignant solo, Playing Love that she really impresses. Playing Love is also an earlier highlight of the album this time given, in effulgent splendour, to the orchestra. I cannot praise this album too highly. 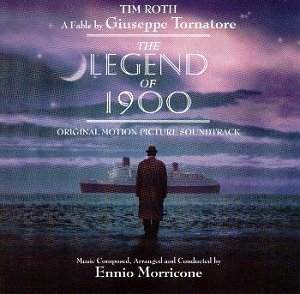 It is my film music CD of 1999.